Sefer Yetzira is a sacred book of great antiquity and power, and one of Judaism's oldest texts after the Bible. In this new translation and commentary, Rabbi Worch leads us step-by-step through innermost chambers of Jewish mysticism. We are allowed to listen in to the arguments between Moses and God, to the whispered dialogue between Rabbis Akiba and Ishmael, and to those fervid and passionate practitioners of whose ecstasies these pages remain redolent. In the beginning was God's desire for us. 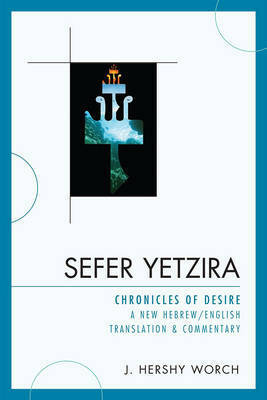 Sefer Yetzira describes the process whereby desire materializes in the Breath of God and thence into the Ten Sephirot and twenty two letters of the Hebrew alphabet. Commentaries to the Sefer Yetzira, through the ages, have reflected the spirit and yearning of those times, the genius and romance of the zeitgeist, be it philosophical, mathematical or contemplative. This commentary reflects the strikingly mystical qualities of Hasidism and the post-modern approach to text. In this book, we read how to listen for the breath of the Living God, how to hear it and breathe it back, in the mystery of our sacred kisses. J. Hershy Worch was born in England in 1955 and ordained in 1992 by Rabbi Shlomo Carlebach. He served as rabbi of Congregation Ohave Shalom of Pawtucket, Rhode Island. Currently, he resides in Los Angeles, California, teaching Jewish texts at the Open Yeshiva - Yeshiva Ateret Tzvi. His previously published works include Sacred Fire: Torah from the Years of Fury 1939-1942, The Kabbalist Haggadah - A Handbook of the Seder, and My Soul Thirsts - A Collection of Hasidic Songs.